Lewis Griffiths, Michael Watson, Declan Egan & Simon Bailey. 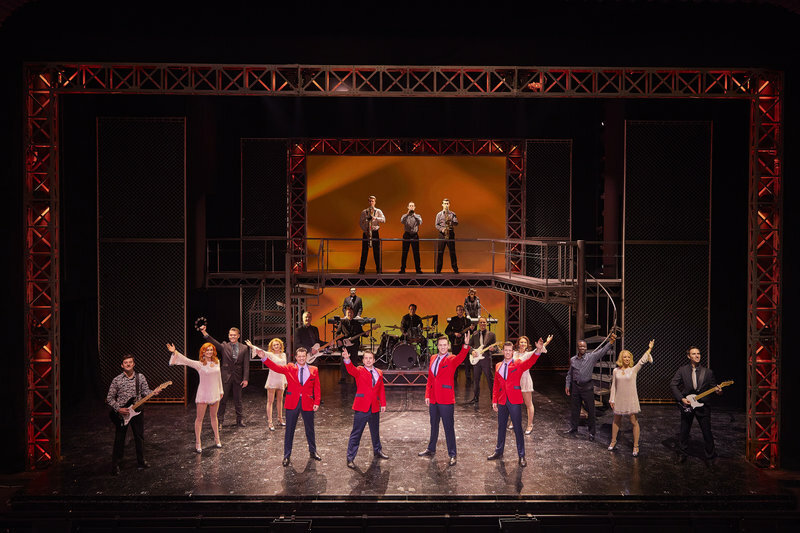 Jersey Boys the hit musical is back in Manchester. 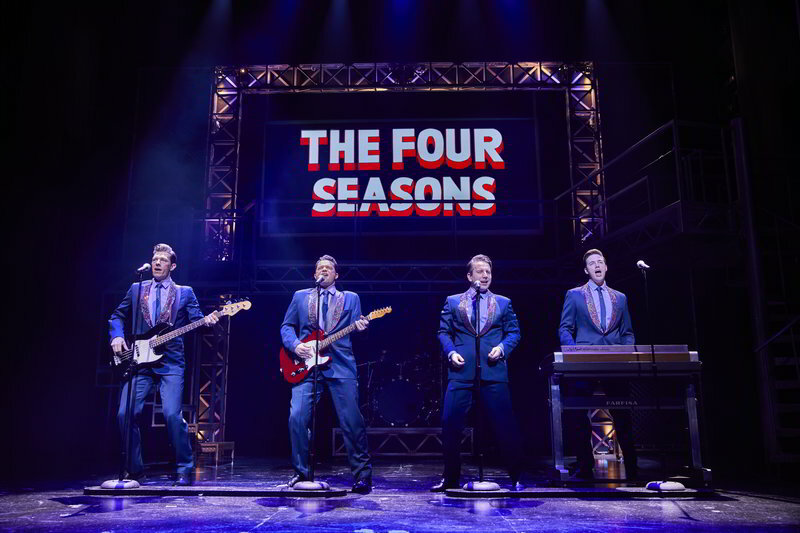 The captivating story of Frankie Valli and the Five Seasons will be told in The Palace Theatre from January 29th. The award-winning true story will stay for just over three weeks and is certain to sell out fast. 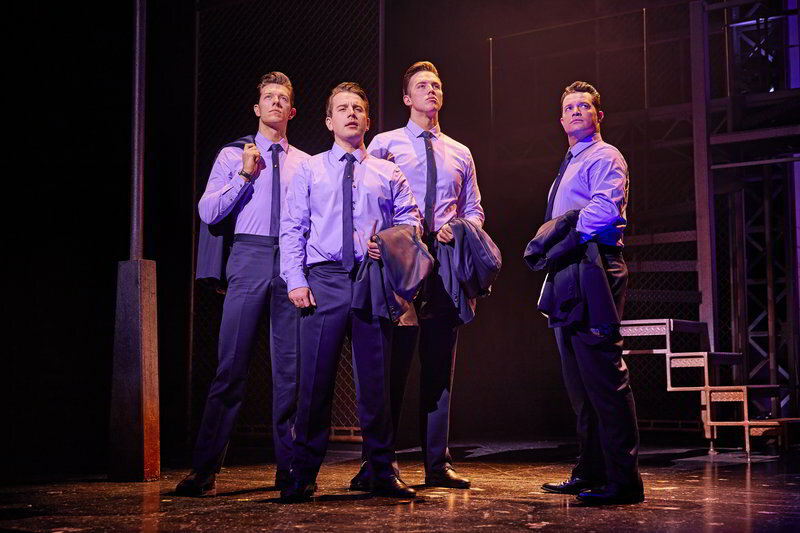 VIVA caught up with the musicals leading man Michael Watson, who plays Frankie Valli, to chat about why he thinks Jersey Boys has made such an impact. Michael Watson as Frankie Valli. 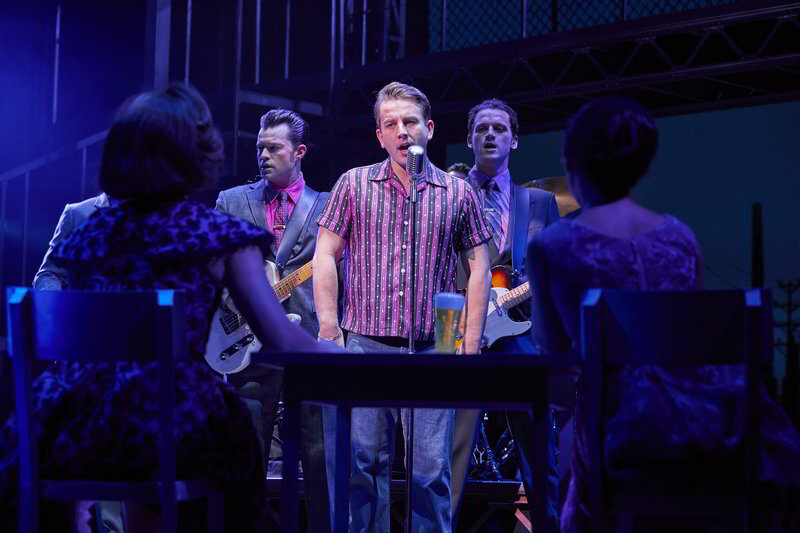 Can you tell us a bit about Jersey Boys in your own words? Jersey Boys is a wonderful musical that I would actually rather call a play with music. It’s the story of Frankie Valli and the Four Seasons. The group started out as just the 4 seasons and it was Frankie, Bob, Mick and Tommy and together they became one of the biggest bands of their generation. They have a really colourful past. So it starts from when Tommy and Mick were just playing in bars. 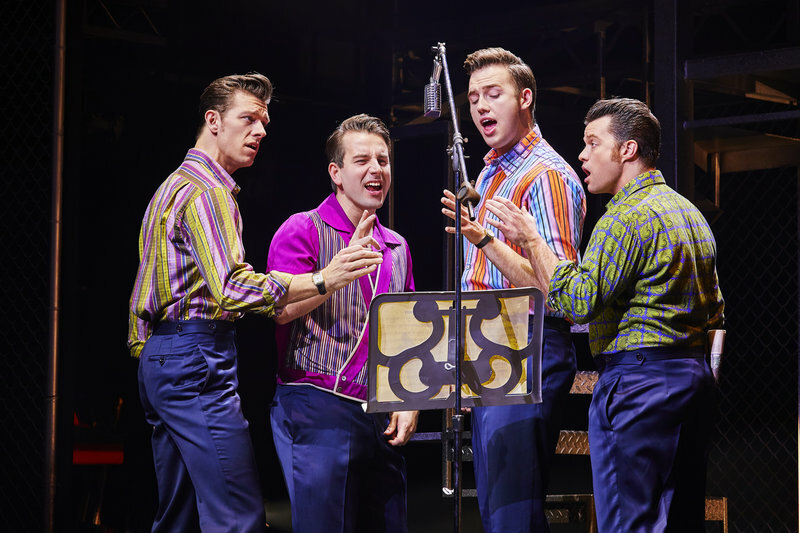 They then meet Frankie Valli [and others] and then they become the four seasons and have hit after hit. It charts their fall from grace too and the final part of their career which I think is wonderful. It starts when Frankie is around 15 and we finish at about 50 so it’s quite a journey. How does it feel playing someone that is real? It feels like you have a responsibility not only to the person that you are playing but the people that are watching because this story can be known. Not only is the voice really iconic but now so is their story so you have to give it what it deserves. Every night you have to give it 110%, you have to really commit. It feels like an honour but also you know you have to keep your mind focused. There is a mindset behind these things to keep you doing it for a year and a half six nights a week. Every night you have to see it as the first night really. What is it about this role that makes you come back since you’ve also played it on the West End? I think the role is so in-depth and there is so much you get to do with this role that it touches everything you love about this job. You get to sing amazing songs, you get to do some great dancing and, my favourite bit, act an amazing script. You get to really become someone else for the night. It’s hard to get bored of that because there is so much else to it. Does it still feel the same as the first opening night did? I don’t know if it actually does feel the same. It doesn’t feel like that same feeling as the first time but what it does feel like is that you have quiet security that you know what you are doing. Every day has a different challenge to be able to do your best work. Each day is different which is amazing to say when you’re playing the same thing every night but it is. Full cast of Jersey Boys. How is touring with the show? Touring has its challenges as well because you have family life outside of the tour. I think though I’ve enjoyed the show even more on a personal level because I think I’ve just approached it with a different mindset. Also taking it to the different parts of the UK is a lovely feeling because people are just so happy to have the show there. Where has been your favourite place to perform so far? How are you feeling about coming to Manchester? I’m really looking forward to it. I’ve heard so many good things about the theatre at Manchester and the crowds and the city itself. I’ve never got to come last time so I’m excited to bring that with us. I feel proud to travel with a show we are all proud of direct from the West End to Manchester so I can’t wait. It went down very well the first time so we are hoping to make it even better this time. Yep! The cities do really get involved here. Yeah, I love that about the more Northern cities. The real sense of community means that everyone really feels like they can let themselves go. Sometimes in cities such as London, even though you’re in a big city there is more individuality to it. People get a bit more nervous to let themselves go. Whereas in Manchester and places like that they are all connected on things like being from Manchester. The feeling of that makes everyone feel like a community together in the theatre and they can really let themselves go. I really love that. It’s been an amazing journey. There was one point where we did five months straight without a holiday. We’ve really put a lot of dedication into this show so when people do come to see it, there is a lot of work that has gone into the show to make it carry on and even begin in the first place. It comes from a passion and we are there because we love it. The tour has been great. Its been a long tour but we’ve all got on really well and still enjoying the show. We are having a great time. 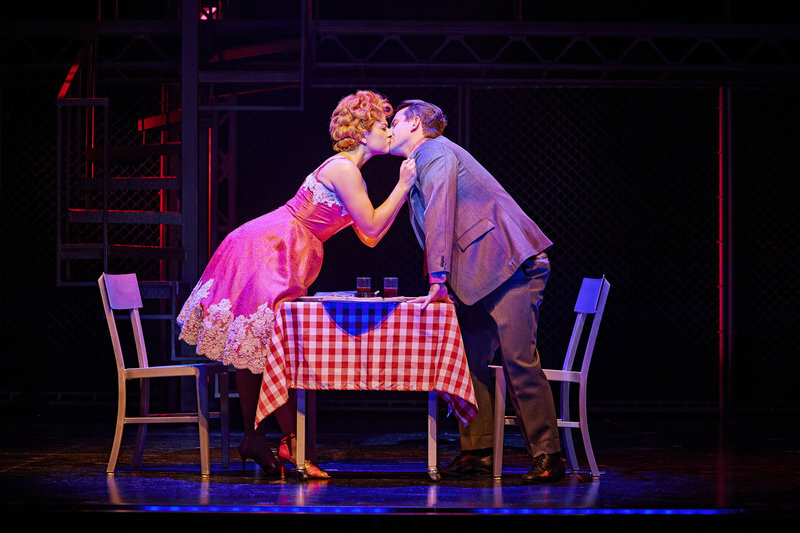 Michael Watson as Frankie Valli and Tara Young as Mary Delgado. Why do you think people should come and see the show? I think people should see this show because not only are you going to get entertained by the wonderful music but your also going to get invested in a story that you weren’t expecting. You are going to laugh, You are going to cry and feel all the emotions. You will feel elated at the end and sing the songs for weeks on end. Annoying for people who haven’t seen the show but great for you haha. So I think you should come.